No amount of drawing or photography can prepare one for the experience that is the Boomslang, as it is affectionately known. And I emphasise the word 'experience' This is not a structure only to look at or to photograph it only reveals its magic when experienced as a pedestrian. It is dynamic and not static, revealing to the user a new delight and a sensory experience at each of its twists and turns. 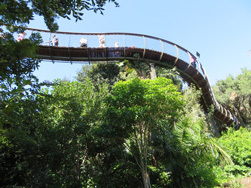 Kirstenbosch Botanical Gardens initiated the Tree Canopy Walkway as a centenary project. The architect, Mark Thomas, worked closely with the engineers, Henry Fagan and Partners, in the design and execution thereof. This kind of structure, essentially a bridge, has been the focus of many famous and illustrious examples all over the world over long periods of time. In many instances, such structures have become icons in the popular imagination as well as benchmarks of technological expertise and innovation. The Boomslang displays many of the most positive characteristics of these famous examples. In basic terms, most of these inspiring bridge structures similar to the Boomslang find their poetic expression in a lack of excess. Each structural member is used optimally in terms of its own inherent material and structural capacities. Together, it forms a whole that is more than the sum of its parts. If humans observe nature very closely, while trying to mimic and understand its complexity and elegance, this is what they would find.This is also in stark contrast to mankind's propensity for excess. It is this kind of observation that underpins the idea of the sinuous, lightweight, non-intrusive steel structure... A structural skeleton, with ribs and a spine (also according to the designers). The architects and engineers, in terms of these notions, then designed a structure that could be manufactured to relatively small tolerances off-site for on-site assembly, with a minimum of intrusion on the natural elements on the site itself. The eventual construction on site was largely accomplished with manpower and a small crane, which lifted some elements into position. All this construction work was achieved without cutting down any trees. All the structural members were finished with hot-dipped galvanising, and thereafter painted to attract plant growth and moss. Finally, the structure was covered with metal frames that would support plant growth. In time, it will 'disappear' into the forest and, in so doing, will increase its quality of intrigue and wonder. As previously mentioned, the amazing qualities of this structure can only be experienced by walking along it. Its gentle, but controlled, swaying reminds one of the structure's minimalist qualities. At the same time, this movement mimics how one would observe the movement of trees in the wind. It heightens, even, one's envy of the flight of the birds overhead. For a brief moment in time, humans are at one with nature. Some visitors might even be able to contemplate their dependence on nature for physical and emotional survival. The fragility of the structure is also a timely reminder of the consequences of mankind's willful destruction of nature. In all this understated beauty and efficiency, the Boomslang finds its meaning. It is no wonder that it is highly popular, and that Kirstenbosch could trace the increase in visitor numbers directly to the completion of the Walkway. The Boomslang is a tour de force that could only be achieved by means of the 'meeting of minds' and the collaboration between the client, the architect Mark Thomas, and the engineer Henry Fagan. In so doing, they also created a structure that has already joined a select group of similar structures across the globe that inspire as they shift the limits of our understanding of what is possible, ever so slightly. The "Boomslang" is a walkway that winds its way through the Arboretum "Enchanted Forest" at Kirstenbosch. It is a steel structure, all hot dip galvanized and then coated to attract moss and growth. This walkway is 130 m long, narrow and slender, with a few wider view-point areas and visitors are raised to over twelve metres above the ground as they walk on the wooden decking. Boomslang: Tree snake, from the Afrikaans (boom tree and slang snake) commonly used in South African English. A highly venomous African tree snake Dispholidus typus the male is bright green and the female olive green. This Arboretum is a planted and gardened forest of over 450 tree species from all over South Africa. It was developed recently in Kirstenbosch's history, and was planted with trees and shrubs from the mid 1980s. Some of the trees here are old specimens and are natural to the site, but most of them are relative youngsters. From the start, a sinuous, lightweight, non-intrusive steel structure was conceptualized, supporting a slatted timber deck, snaking its way into, through and over the ever-changing tree canopy. A structural skeleton, with ribs and a spine, in galvanized steel, painted to attract moss and growth, supported on slender steel columns intertwined with creepers. The objective was to lightly inhabit the canopy, in a discreet, almost invisible way. The walk is generally narrow and slender and widens only at two places, one for the view, one for the shade. It is wheelchair friendly taking advantage of the sloping ground and starts and ends within the arboretum, so there is almost no visual impact from the lawns and walks in the garden. There are no mechanical or electrical aspects to the walk and the gentle gradients will easily raise visitors to over 12 metres above ground. The overall length of the walk is 130 meters, there are educational boards along the walk, access is from either end. Working closely with young graduate architect and filmmaker, Chris Bisset and under the watchful eye of horticulturist, Adam Harrower, a series of ‘hot spots’ were identified, both at the nexus of the existing paths and around certain key trees. Key to the development of the design, was how the structure was to be inserted into a sensitive site, without major damage and disruption to the forest. Each bridge component was separated into 3 portions, each 6 metres long (two rib cages, one spine). The components were laser cut and pre-fabricated and assembled off site. All steel was hot dip galvanized before being delivered to the working area of the garden for a double coat of epoxy. These portions were then manhandled into the forest and erected with a small crane into position. No trees were cut down in the process. The top coats and the timber were then added in-situ. The pre-fabricated bits were assembled and fitted together to a pre-ordained shape to a tolerance of 30mm. The walk was completed in May 2014 and there have been a record number of visitors to the garden since then.